Turn off your lights from 8-9pm and do one of the following, or think up your own way to make good things happen in the dark! -Treat yourself (and someone else) to a candlelight dinner at one of our participating restaurants. -Help us out by taking photos and emailing them to pictures@lightsoutsf.org. 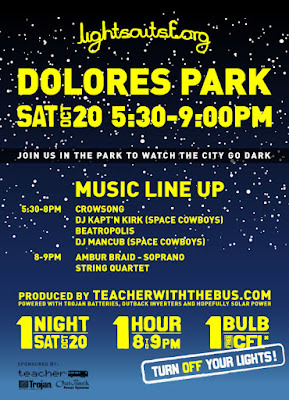 -JOIN US IN DOLORES PARK FOR FREE MUSIC!!! This entry was posted on Saturday, October 20th, 2007 at 4:42 pm. You can follow any responses to this entry through the RSS 2.0 feed. You can leave a response, or trackback from your own site.